Title: Gets rid of the image of the pure-hearted young man, challenges his first villain role…. Scion, handsome, first love… these are the words that define Jo Hyun Jae. 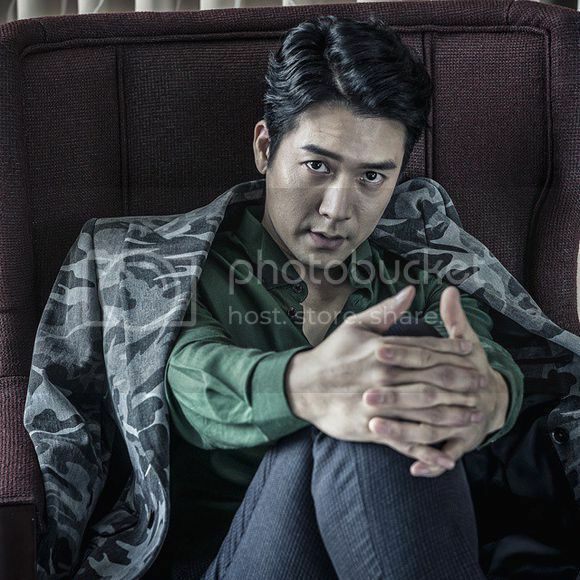 With chilly eyes he looks at the camera lens, this is our first meeting with Jo Hyun Jae. 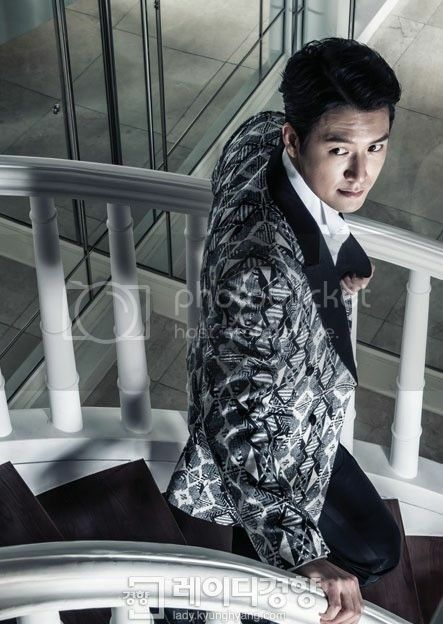 Passing through the long corridor, Jo Hyun Jae (35) opens the door and enters. We follow him like a shadow. His eyes are lit with kindness, his aura calm and sedate, but we can detect a refreshing energy in him. I do not know if he realizes it or not, but his solemn voice as he greets us is somewhat strange. Editor: I wonder why the reporter says that JHJ’s “solemn voice” is somewhat “strange”. Maybe because Han Do Jun’s style of speaking is different from JHJ’s normal style? In the new SBS drama “Yongpal”, actor Jo Hyun Jae plays Han Do Jun, the ruthless half-brother of Han Yeo Jin, who harms his younger sister even unto death so he could grab her inheritance. This is a big event in the life of actor Jo Hyun Jae. Deeply embedded in people’s minds are images of the pious priest Andrea in “Love Letter”, the intransigent in love Seo Dong in “Seo Dong Yo”, and the supremely pure-hearted Han Kang in “49 Days”. He is always protecting the woman he loves, facing and overcoming hardships and charting his own destiny. But this is just one facet to this actor. Watching the wicked and ambitious villain Han Do Jun in “Yongpal” is really very interesting simply because the actor playing this character is actor Jo Hyun Jae. This is the first time he is acting the villain since he started acting, so he is feeling very encouraged. He said that having waited for this day, his excitement is very high every day. A pleasing appearance but revealing fierce eyes and eerie laughter flowing with malice, it is now time to face the new Jo Hyun Jae. Question 1 (Q1): It has been 1 year and 6 months since your last drama, “King’s Daughter, Soo Baek Hyang”, ended. You look a bit thin. Jo Hyun Jae (JHJ): I think I lost 11 kg. During my break, I decided to give myself some changes. Previously, I have been too focused solely on moving forward. But, it is also necessary to give myself a rest, so aside from engaging in sports, I have also been travelling. But for a period of 6 months, I worked out at the gym almost every day. Q2: My perception of you is different from what I am seeing, that should be the reason. You are a lot slimmer than I thought, so I was surprised. JHJ: Recently, I made adjustments to my diet. Originally, I eat a lot. But since I started filming, I have been eating a lot less. When a person is hungry, they seem more on edge and a lot sharper, their eyes are more toxic. Thinking about my character Han Do Jun, I always have to put myself in a sensitive state. Q3: What is for lunch today? JHJ: Salad and a half bowl of brown rice. Q4. The weather is so hot, and with that kind of diet, you might collapse. Don’t you feel you are pushing yourself too hard? JHJ: I have been wanting to play villain. I haven’t played this kind of character before, so I am a bit nervous, but at the same time, I am determined to do well. After each broadcast, we monitor the reaction of the viewers. There were viewers who said that “Jo Hyun Jae’s smile is completely different from before”. I think I was able to convey the emotions the character intended, so I feel pretty good. My energy increases when I read such positive reactions. Because of that I don’t find it difficult even if we have to film overnight. Q5: Han Do Jun deliberately puts his sister in a coma so that he could grab her position as heir. But we do not understand why he became wicked. From the standpoint of acting, isn’t it necessary to understand why so you can be convincing? JHJ: From the beginning of the drama, Han Do Jun is presented right away to the audience as this wicked character, a typical bad guy. On the surface we see Han Do Jun’s evil side, weak and complex. Why is this man so dysfunctional? We want to understand why he became wicked. His real face will be revealed gradually as the drama progresses. Q6: I think the greatest attraction of Jo Hyun Jae playing a villain is because it is so unexpected. How can someone with such an innocent face be perpetrating evil acts? JHJ: So far in my acting career, the words most often heard about me are “pure youth”, clear eyes, sunny smile, etc. Maybe with this role, I will be able to get rid of that (laughs). That is exactly it, when someone makes an unexpected action the impact will be greater, so everyone’s reaction will be more intense. Q7: Behind the smiling face hides a dagger, a man with 2 faces. Do you have role model for this character? JHJ: I have not checked out other onscreen villain characters. Rather, I draw from my own experiences and from real people I have encountered. I tend to find clues from deep inside me, rather than from external forces. With this work, I also want to draw inspiration from deep inside me. Q8: Are there similarities between Jo Hyun Jae and Han Do Jun? JHJ: I think deep inside all of us there lurks a wicked side. I am not talking about extreme wickedness we see depicted in dramas and movies. I am talking about our big and small angry reactions to various daily encounters which we tend to hide deep inside us. For example, when we are in a dispute with someone, or when we find out that we have been lied to, or when we find ourselves in a position that we don’t like, or when we are facing a tough situation. Those are the kind of memories from which I have been drawing inspiration. Q9: Jo Hyun Jae, what are the difficult things that has happened to you which you can recall? JHJ: In terms of my career…. There are times when even though I want to act, but there is no opportunity to do so. An actor finding an acting project that he truly likes is really fate. Not all actors can get the role that they really want all the time. There are times when you spend a long time in an uncertain state and while you are waiting you have this strong desire to work. Times like that can be very depressing. While I was in the Army, not being able to act was more difficult compared to the military training that I had to undergo. An acting senior who has been acting for 30 years now told me that he experiences the same kind of distress when faced with the same situation. He said that if he finds himself resting for 3 months he begins to feel distressed. When I heard his thoughts, it was then I realized that waiting for a good role is the fate of actors. Editor: I was hoping JHJ would mention a difficulty in his personal life, but, once again, he evades talking about his personal life. Q10: After your first villain debut, what are your thoughts? Is there a fateful feeling? JHJ: After the first episode aired, I heard comments saying that I was “really like the devil”. I felt very happy to hear such comments. Now hearing praises like my acting is “chilling” is much better compared to gaining popularity as a handsome youth or receiving praise for my good looks. Of course, there will be a lot of female fans (if he was protagonist instead of antagonist) (laughs). I wanted to know how it feels to be hated as a villain, I think it is interesting. The feeling is similar to how I felt back when I was just starting as an actor. Q11: It seems you are really hungry for this new challenge in your acting career. JHJ: For the first 15 years of my career, I have specialized in first love and “pure youth” roles. Because of that, an image has been created, and even if I wanted to do villain roles, I was never given an opportunity. As an actor who is entering the mid-30s I just want to celebrate this new period in my life by doing something different. I am very happy that I am being given this chance to try something different. Recently, I am very happy every day. Q12: Have you ever thought of doing other things aside from acting? If you still have many people remembering actor Jo Hyun Jae as the priest Andrea in “Love Letter”, which is 10 years old already, then that means that the image left a very strong impression in people’s minds. JHJ: “Love Letter” aired in 2003, so it is 12 years old already. It was a great drama that became a mania at that time. As an actor, it is undeniably a great honor for me that a character that I have given life to is remembered by many people for such a long period of time. I am truly thankful for those acting projects that made Jo Hyun Jae name easier for the public to recall, but at the same time, because of the strong impression the image created, it has become that much harder to change my image. I think it is high time to shed that image, and I think I can do it. Q13: I watched “What would you be if you were not an actor” Face (Editor: Maybe it is a variety show?) I heard that there were many actors who are worried about the future of their careers. JHJ: I obtained my high school diploma by taking a qualifying exam (GED). At that time my parents’ business was not doing well and our family was in a bad situation. What was I to do? Instead of worrying, I decided to enter the workforce earlier than my peers. I am not that much interested in academics (laughs). I was still very young but I already wanted to find my own way in life, so when I finished middle school, I decided not to pursue high school anymore. At that time, I would take on whatever part-time job was available. Q14: You were in a boy band with actor Kim Kang Woo, you share an “unexpected” history. Was singing one of your part-time jobs too? JHJ: I was 17 years old when Kim Kang Woo and I joined the group “Guardian”. You may not know this, we prepared for a year but made only 1 TV appearance on a major broadcast channel before the company managing the group had to close down. But during that period my curiosity about the broadcasting and performing arts industries greatly increased. I consider those days as an important opportunity to think about what I really wanted to do with my life. It was at that time that I realized that becoming a singer is not the path that I wanted to take (laughs). But during that period there were plenty of offers for me to return as a singer, but I rejected those offers. Then, for 2-3 years I just did all sort of different things, until eventually I have determined to pursue an acting career. At that time I was already 20 years old. Since then, up to now, I haven’t thought of doing anything else other than acting. Q15: Your first work was for a CF with Kim Ha Neul, then you worked with Soo Ae in “Love Letter”, Song Hye Kyo in “Sunlight Pours Down”, then Kim Tae Hee in “Forbidden Love”. You are blessed to have worked with great actresses. JHJ: In the chewing gum CF, Kim Ha Neul was standing outside the train, while I was seated inside the train. You can hardly see me (laughs) :D Then, with Kim Tae Hee, it has been 10 years since we last worked together in “Forbidden Love”. At that time she had scenes where she had to be tied to wires for some action scenes, I think she did pretty well. Even then I found her to be a good worker, even if she is tired she does complain. I think she is the type who can endure. Q16: Which among your works finally convinced you that you really want to pursue acting? JHJ: That would be “Love Letter”. Although I was lacking because I was still a rookie back then, but still, when working on that drama I could not help but think that “this is the road that I want to take”. I wanted to do better, which has become a kind of greed. Every time a work is finished, waiting for the next work is very hard, but I never thought of giving up. I know that I am still lacking in many ways, but still, I hope I can still practice my profession for 30 years more. Comment: You have my support every step of the way. Q17: Without realizing it, you have now been acting for 15 years. When you look back on your early years as an actor, what do you think about? JHJ: Back in my 20s I wanted to play the role of a rebel, but I was never given the chance to do that. Although I have regrets, I decided not to worry over those things anymore. From now on, I will just focus on what I can do. It is not idle talk, recently I feel as if I am back to being a rookie. Thinking about acting, I could not sleep at night (laughs). Q18: What is it about acting that keeps you thinking to the extent that you could not sleep? JHJ: Lying down at night, while trying to sleep, I can’t help but try to hold on to the emotions of the character. 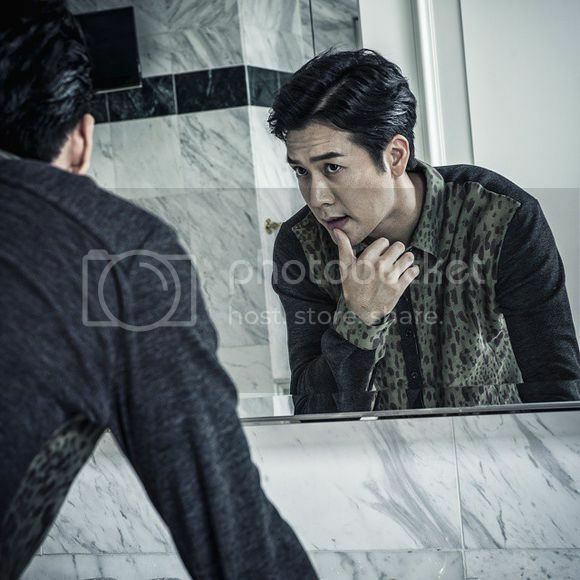 I think of details about Han Do Jun’s facial expressions, his eyes, his actions, cooperation with other actors. Every single detail comes to mind, details like breathing, etc. Without realizing it, two hours have already passed. Q19: For an actor who has been practicing his profession for 15 years, to still feel this excited, that is amazing. It seems you really feel deeply about it. JHJ: I am really very happy. When monitoring, it is not the same as before. It is fun discovering another look in my face. Maybe I will do villain roles a few more times. But aside from villain, I want to be able to show diverse personas from now on. Q20: How do you spend your days (when not working)? JHJ: I love going up the mountain, so whenever I have free time and whenever the heart wishes to go, then I go hiking. Sometimes I go with my friends, but sometimes I go by myself. During my break, I went mountaineering for 3 days 2 nights in Geojedo (Geoje Island). I also often go to Bukhansan (Bukhan Mountain). Q21: Whenever I meet someone who likes mountain climbing, I am always curious what it is they find appealing about it. JHJ: There is so much to love about climbing mountains. You become healthier, your complexion looks better, you develop physical and mental discipline. Above all, while crawling up the mountain you can empty your mind of all distractions. You can leave behind all the worries that have been plaguing you. Whenever I have the time, I go up the mountain. Q22: I am suddenly curious. What is the biggest rebellious behaviour you have ever done? JHJ: Rebellious… I don’t remember too much. Maybe fight with friends back when I was still a student? Q23: These are the bad behaviour I am talking about: discarding cigarette butts in public, violating traffic signals, etc. JHJ: Honestly, I am the type who follows the rules. In fact, the nickname my friends gave me is “ajuhssi” (uncle). They say I am too tired to live. I even quit smoking 5 years ago. Comment: Yey! Glad to know that he has quit smoking already! Q24: So in the future, what kind of rebellious behaviour would you likely do? JHJ: Smoking again, can that be considered rebellious behaviour? These days, I don’t even drink alcoholic beverages even if I can. However, I don’t drink while filming. So, maybe, at the end of this work, I can drink again. Q25: When searching the name “Jo Hyun Jae” in search portals, the term most associated with your name is “married Jo Hyun Jae”. It seems people are curious about that. No marriage plans yet? JHJ: Maybe because I am already 35 years old, that is why people are curious about it. Of course, I want to get married someday, but first I want to fall in love. But, these days, my priority is “Yongpal” (laughs).